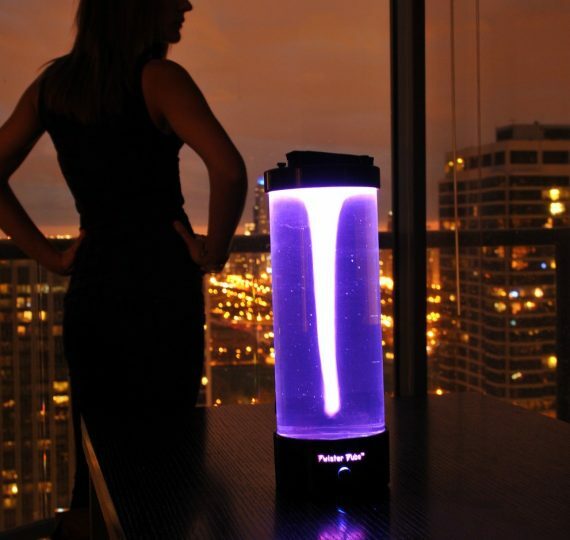 Twister Tube Is A Modern Lava Lamp… Without The Lava | OhGizmo! Welcome To The New OhGizmo! There’s a bunch of things you could get to decorate your desk, at least in terms of lighting. The Lava Lamp was a staple of many a dorm room, throughout the 60’s and even the 90’s when it made a little comeback. But we’re pretty sure that fad is dead. And while we’re not certain the Twister Tube will ever take its place, it’s doing a mighty good effort of it. The Twister Tube stands 15″ tall with a polished glass tube, sleek black base, and water resistant lid. When filled with distilled water and our special Twister Solution™, and powered on, a motor silently springs to life and begins turning the water. In seconds, a miniature tornado forms, drops down, and finally hovers just above the custom Twister Bar™. Although this is more commonly referred to as a water vortex, it looks and acts eerily like a real tornado including the “cloud deck”. It’s $60 and comes in a variety of colours. Tried to place an order for Twister Tube, but the process failed. Tried to call them, disconnected. Hmm.